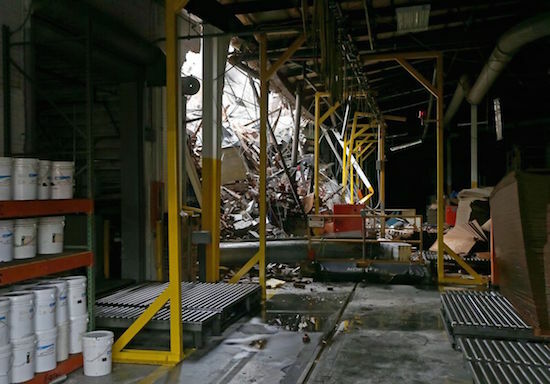 Interior of the Loy-Lange Box Co. after a boiler explosion killed one worker there and then launched across the street and killed two brand new hires at Faultless Healthcare Linen in St. Louis. A boiler explosion that killed three people and injured four others Monday in two different businesses in St. Louis was a commercial accident, the city’s fire chief said. Two of the four survivors of the blast shortly before 8 a.m. Monday remain in critical condition, said St. Louis Fire Chief Dennis Jenkerson. He added one of them was undergoing surgery. A boiler exploded at the Loy-Lange Box Co. in south St. Louis, killing one person there, Jenkerson said. Much of that equipment flew about 500 feet across the street onto Faultless Healthcare Linen, a laundry business, killing two people there when it crashed through the roof, he said. The equipment was about the size of a van. The boiler was a cast iron cylinder about 10-12 feet long and 3-3.5 feet in diameter and weighed a ton or more, Jenkerson said. Three brand-new hires at a linen laundering company were filling out paperwork in the office Monday morning when the boiler crashed through the roof, killing two of them and critically injuring the third. Loy-Lange Box Co. specializes in corrugated products, including point-of-purchase packaging and shipping containers. Federal workplace safety officials are investigating. Federal workplace safety regulators said the St. Louis company whose boiler exploded has paid fines for workplace violations three times since 2014. Scott Allen of the Occupational Safety and Health Administration says the Loy-Lange Box Co. paid a $3,741 fine after an August 2016 inspection found holes in floors that prevented proper cleaning. An inspection in November 2014 found defective equipment, including a forklift without lights and damage to some safety latches. The company paid $6,566. And in February 2014, the company paid $2,450 for defective energy control procedures, such as not properly training employees to ensure machinery was turned off and powered down.